Ah. I'm not using Citadel paints, but a bootleg set of acrylic paints I dug up in my garage a few weeks ago. Is it universal for all acrylic paints to have those qualities? I've heard that some cheap acrylic paints don't like water. You can try thinning down a small amount of your paint and see if it mixes well. I will try that, thanks for the help! I've heard that some cheap acrylic paints don't like water. This is true. A lot of model paints are oil based, and oil doesn't disolve in water. I'm just referring to the average model paint you'd find on amazon. Anyone got a good, basic looking high grade? No cool details or weapons really; just a massed produced mobile suit. I want to make one punch Gundam. Thanks. I quickly looked and I found a gm so boring it's perfect. 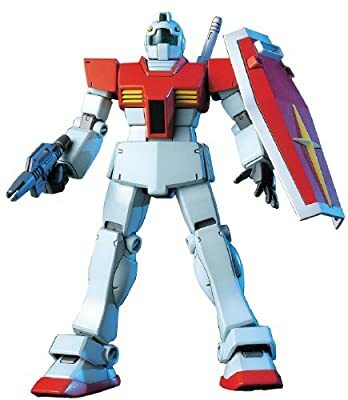 A 1/144 model of the GM from the original Mobile Suit Gundam. Comes with Beam Spray Gun, beam saber, and shield. It got good reviews and I already have some knuckle weapons I'm going tu use. Make sure to have some plastic cement available, as it's got a TON of seam lines running down the legs and arms. Yeah I heard it's only a few runners. But good to know so it'll look good. Make sure to drop some pics when you're done. It's not so much the part count that's the issue, as it is the way the parts attach. Just be sure to clean up the giant seams and it'll look awesome. "a few" = 2 runners. they're moulded in multiple colors, mind you. That's the case with most old HG kits. They're significantly better nowadays, but some can't have perfect color separation/seamlines just due to either the inherent design or small scale. You'll be doing extra regardless of which grade (sans maybe a PG). But if you're making a PG you're most likely doing extra already. How does the assembly of these figures compare to vehicle models?